Biggest-ever rally over an anti-Islamic film has brought scores to Beirut, Lebanon, following a call for mass demonstrations by Hezbollah chief Hassan Nasrallah. Most of the demonstrators were wearing green and yellow headbands, indicating membership in Hezbollah. The official number of participants is yet to be released, but has been estimated based on video and photos to be over a hundred thousand people. 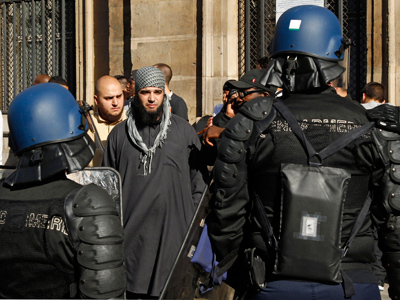 "America, hear us – don't insult our Prophet," the protesters were chanting. The rally was split into two columns, with women marching separately from men. Some were holding portraits of Syrian President Bashar al-Assad. Sporadic shouts of "Death to Israel" and "America is the biggest devil" could also be heard from the crowd, as RT's Lucy Kafanov reported from the scene. A protester, nevertheless, told RT that the demonstrators' anger is not with the American people, but with the US government for allowing the film to spread. The crowd swelling, Hassan Nasrallah in person addressed the gathering. 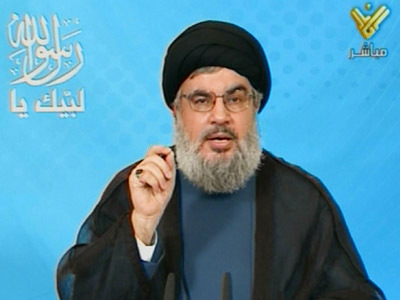 In his rare public appearance, Nasrallah announced the beginning of a global campaign to halt the screening and sharing of the provocative film ‘Innocence of Muslims.’ He stressed that the world does not understand Muslims’ deep reverence for the Prophet Muhammad. "This is the start of a serious movement that must continue all over the Muslim world in defense of the prophet of God," he said to roars of support. "As long as there's blood in us, we will not remain silent over insults against our Prophet." "Prophet of God, we offer ourselves, our blood and our kin for the sake of your dignity and honor," said Nasrallah. The Lebanese political leader also called on the international community to criminalize insults to Islam as well as Christianity and Judaism. “The US must understand that releasing the entire film will have very dangerous repercussions around the world,” Nasrallah said, according to Press-TV. He urged for the movie’s creators to be punished appropriately. Monday was Nasrallah's fifth public appearance in six years, and the first time he made a full speech in person to thousands of his supporters since 2008. Nasrallah has been in hiding since 2006 when Hezbollah fought a month-long war with Israel. 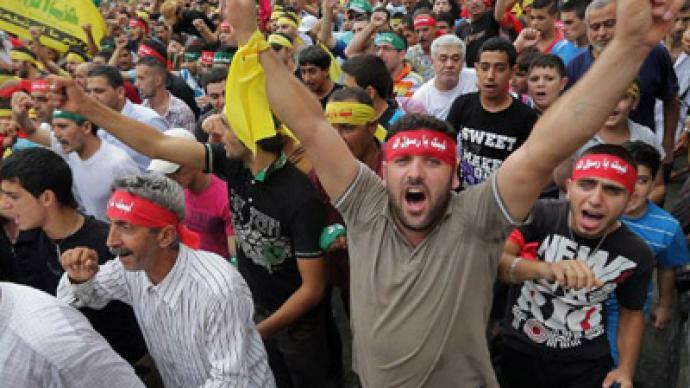 Nasrallah first called for widespread nonviolent protests on Sunday. The US must be held accountable for the film because it was produced in America, he said. Mohammad al-Asi, an Imam at the Washington DC Islamic Center, says America's rhetoric towards the Middle East is largely to blame for the continuing protests across the world. “This should become a very instructive lesson for US diplomats and officials to gauge the depth and the range of wrath and rage that the Muslims across the world have towards United States policies,” he told RT. 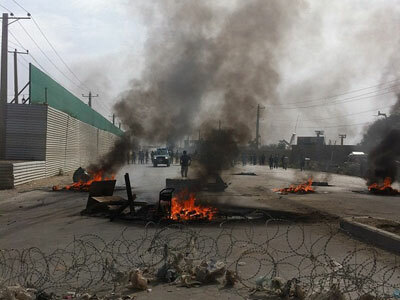 ­Though the rally in Beirut stayed well away from the US embassy there, reports suggest that the American mission in Lebanon has started to destroy classified material as a security precaution. The Beirut embassy had “reviewed its emergency procedures and is beginning to destroy classified holdings,” says a State Department status report obtained by the Associated Press. 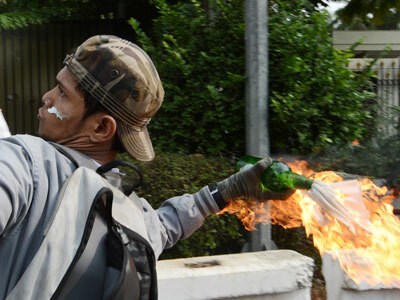 In Washington, officials said there was no immediate threat to the embassy. The decision to “reduce classified holdings” was routine under such circumstances and made by the embassy staff themselves, they added. Earlier Monday, the State Department once again warned US citizens to avoid travel to Lebanon since the potential for a “spontaneous upsurge in violence remains” in the country, while Lebanese authorities are not able to guarantee protection. 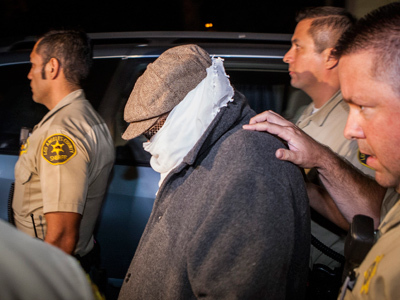 The amateur film ‘Innocence of Muslims’ sparked outrage across the Middle East, North Africa and Asia last week. Many Muslims were infuriated by a clip of the film posted to YouTube that mocked Islam's Prophet Muhammad. 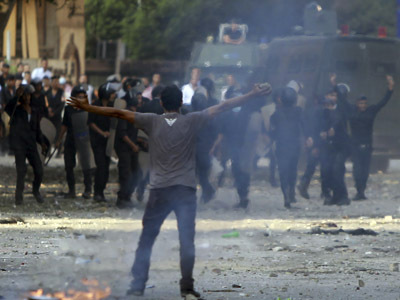 In protests which followed across the world, several people have been killed and dozens were arrested as angry crowds vented their anger in front of the US embassies and consulate services.